Conceived following a wish of Louis XV, Saint- Geneviève church was built by Soufflot then by Rondelet from 1764 to 1789. In 1791, the Constituent Assembly transformed the new church into a temple destined “to receive the great men of the epoch of French liberty.” Mirabeau, Voltaire, Le Peletier of Saint-Fargeau, Bara, Rousseau and Marat were the first to be accepted into this prestigious place. The Panthéon was born. Napoleon I visited the building on February 13, 1806, and allocated a sum of 600,000 francs for the work of strengthening the dome. Some days later, February 20, he decreed that the building was a Catholic church under the double invocation of Saint-Geneviève and of Saint-Napoleon. The crypt of the church continued however to receive the burial of dignitaries of the Empire. In 1830, Louis-Philippe re-established the Panthéon which was designated “The Temple of Humanity” in 1848. 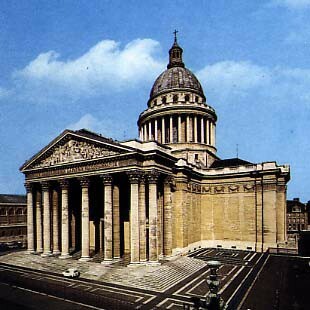 A short time before the proclamation of the Second Empire, the Prince-President Louis-Napoleon again transformed the building into a church which was named “The National Basilica.” It was the Third Republic which definitively re-established the Panthéon after the death of Victor Hugo in 1885. Under the Empire, in addition to the work of strengthening the dome, the Emperor ordered the decoration of the dome vault. Gros was charged with realizing a fresco representing the Apotheosis of Saint-Geneviève, protector of great French sovereigns, where Napoleon I, initially foreseen after Clovis, Charlemagne and Saint-Louis, was eventually replaced by Louis XVIII under the Restoration. In 1813, Baltard Senior was named the building architect. He gave the drawings for the monumental bronze doors and for a new skylight. The low-reliefs of the pediment are the work of David D'Angers and represent the Homeland between Liberty and History distributing crowns to great men. On the right, among the civil personalities, are Monge, Carnot, Berthollet, Laplace, David and Cuvier and to the left, among the military personalities, are Bonaparte, André Etienne, the drum of Arcole and the tower of Auvergne. In 1853, two groups of marble were ordered from the sculptor Maindron. “Attila and Saint-Geneviève” and “Clovis Receiving the Sacrament of Baptism” today frame the main door under the peristyle. The rest of the interior, including the famous frescos by Puvis de Chavannes, dates to the Third Republic. In the crypt, four vaults contain the sepulchers of the great dignitaries of the First Empire. Tronchet was the first in 1806, and 43 others followed him: Béguinot, Bévière, Bougainville, Cabanis, Caprara, Carnot, Caulaincourt, Choiseul-Praslin, Claret de Fleurieu, Cossé, Crétet, Démeunier, Dorsenne, Durazzo, Garnier de Laboissiére, Jacqueminot, Lagrange, Lannes, La Tour d'Auvergne, Le Blond, Legrand, Malher, Marceau, Morard de Galles, Ordener, Papin, Perregaux, Petiet, Portalis, Praslin, Regnier, Resnier, Reynier, Rousseau, Senarmont, Sers, Songis des Courbons, Thévenard, Treilhard, Vien, Viry, Walther, Winter. The ashes of Father Gregoire and those of the mathematician, Monge, were transferred to the Panthéon on December 12, 1989. The tombs of Hugo and Zola, two of the greatest French writers who, each in his own manner, drew the ferment of their work from the First and Second Empires, are situated in the Gallery of Crowns of this same crypt.